Aerial photo of The Christian Science Center taken from 175 Huntington Avenue (now 177 Huntington), 1972, P03146. Courtesy of The Mary Baker Eddy Collection. In 1886 the Church of Christ, Scientist (later called The Mother Church) purchased a parcel of land in Boston’s Back Bay section, on which to construct its first church building. Since then both the church and its surrounding neighborhood have grown and evolved. With significant renovations underway on what today is known as the Christian Science Plaza, it’s helpful to look back at the last time a project of this scope took place, some 50 years ago. These photos from our collection offer some interesting perspectives. During the 1960s Boston was undergoing major redevelopment. Officials embarked on a plan to revive the inner city with large-scale construction projects, including the 23-acre Prudential Center and the 790-foot John Hancock Building. 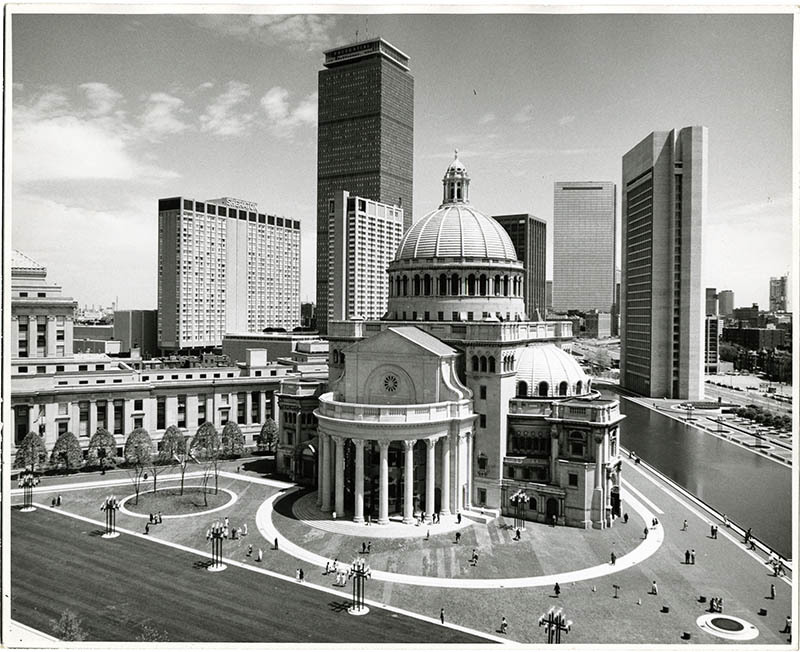 As part of this urban renewal, the nearby Mother Church announced its plans in 1965 for what was called the Christian Science Center, redeveloping 31 acres of residential, business, and public land in the Back Bay.1 The project involved the construction of various new buildings and a public plaza. Private developers were also encouraged to undertake residential, commercial, and retail projects nearby. The church hired I.M. Pei & Partners and Araldo Cossutta to design the Plaza. This included a new Sunday School building, two administration buildings, and a large reflecting pool sitting atop an underground garage. The design was heavily influenced by Brutalism, an architectural style popular in the 1960s and 70s. Photo of groundbreaking ceremony on the Church Center, August 15, 1968, P03293. Photo by Jim Hughes, The Christian Science Monitor. Courtesy of The Mary Baker Eddy Collection. Left to right: George Dobbin, President of Aberthaw Construction Company; Carl B. Rechner, Development Consultant; Clayton Bion Craig, representing The Christian Science Board of Directors; and Araldo A. Cossutta, Partner-in-Charge, I. M. Pei & Partners, Architects. Construction began in 1968, with work on the 550-car underground parking garage and the reflecting pool, which measured 686 feet long, 98 feet wide, and 2 feet deep. The pool held 1.3 million gallons of water and soon become a main attraction for locals and tourists alike. A hose pumps water into the reflecting pool, circa 1972, LSC010.01.005.06.013. Photo by Peter Dreyer, Courtesy of The Mary Baker Eddy Library. The two new administration buildings were needed to alleviate overcrowding in existing church office spaces. The Colonnade building—a five-story structure running parallel to the reflecting pool—was completed in 1972. Another 27-story administration building was constructed at 175 Huntington Avenue (now 177 Huntington), supported by 500 pilings sunk 180 feet into bedrock. Construction on the new Sunday School began in 1970 and lasted until 1972. In 1973 construction started on a new portico entrance to the Extension of The Mother Church, styled with Corinthian columns. It sits on the site of a previous church administration building and the former St. Paul Street. The Portico’s 1975 completion capped off this multi-year Plaza redesign. In addition to creating a beautiful new entrance, it marked the first time that the church was visible from nearby Massachusetts Avenue. View of the completed portico entrance to The Mother Church Extension, 1975, P03604. Photo by Gordon Converse, Courtesy of The Christian Science Publishing Society. “Annual Meeting of The Mother Church,” The Christian Science Journal, July 1967, 340. “Annual Meeting of The Mother Church,” The Christian Science Journal, August 1971, 399-400.